I arrived in downtown Denver ready to close my week at the 2017 Crowne Plaza General Manager Service Training Summit. I was excited to work with this InterContinental Hotels brand that is evolving both its focus in the marketplace and its service culture. While checking in, I immediately scoped out my ideal dinner/evening jam session spot in the lobby bar/restaurant. Now all I needed was directions to the closest CorePower studio so I could squeeze in a late afternoon yoga class. As any business traveler knows, balancing a little personal time and business responsibilities while on the road can be a real test. When a hotel is expressly focused on helping me accomplish that objective, it can make a world of difference. Enter Crowne Plaza. IHG is investing $200 million in its Crowne Plaza properties in the Americas region during the next three years through its Accelerate initiative. 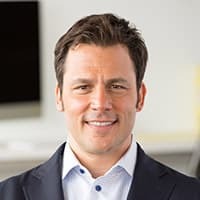 A lot of that money is going toward innovations that the hotel chain promises will deliver a unique guest experience, expressly focused on the modern business traveler. As someone who spends as many nights a year in hotels as he does his own bed I know the harsh realities of modern business travel. It’s exhausting and lonely, and at times it can leave you feeling very isolated. It’s the reason I opt for dinner in the lobby bar and tend to favor fitness classes vs. going at it alone. I hunger for a little more human connection. The new Crowne Plaza service commitment, “Dare To Connect,” speaks to me because it is for me. The brand is bringing humanity back to business travel, and I think the chain’s guests will be blown away by it. During the Service Training Summit, I was lucky enough to spend a little time with Monte Jump, Director, Food and Beverage and Service, at IHG, to discuss the evolution of the Crowne Plaza brand and its renewed emphasis on taking care of today’s business traveler. The process behind that transformation is a great example of how even established brands can be disruptive and reinvent themselves in fresh ways to serve their customers. What I found most inspiring, among the many innovative things Crowne Plaza is doing, is that it’s investing heavily in human connections. As the world between work and play continues to blend for the modern business traveler, it’s all too easy to lose that sense of personal connection. Crowne Plaza noticed this gap within its own guest experience and intends to close it by initiating more individualized customer solutions and interactions. Under its new model, which emphasizes the value of guest-centric and personalized communication, hotel team members are free to go beyond that script. Authenticity is key in every conversation or interaction, both with customers and colleagues. As a business, IHG places a very high value on collaboration. And this transformation to a new service model embodies that commitment. The new “WorkLife” room turns the traditional guest room on its head, enabling seamless productivity and creating more space to work, socialize and rest, allowing a modern business traveler to “have it all” within their hotel room. Those conversations and insights led to a refreshed design of the hotel spaces, in both individual rooms and common areas. So IHG set out to create a hotel experience reflecting that blend. It designed a “WorkLife” room — the Crowne Plaza brand’s guest room of the future. It turns the traditional guest room on its head, enabling seamless productivity and creating more space to work, socialize and rest, allowing a modern business traveler to “have it all” within their hotel room. But if people want to venture out beyond their room, there are multifunctional workspaces where they can plug in, interact with others or grab a quick snack and chat between conference calls. 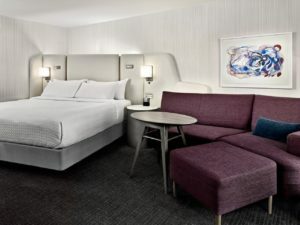 These community areas promote connection and human interaction, which is what Crowne Plaza found was missing from its previous business traveler model. “It’s all about trying to fulfill the needs of that modern business traveler,” Monte shared. Just as every business traveler is different, so is every employee. Crowne Plaza’s dedication to personalization at every level demonstrates an enormous shift in the hospitality experience and an understanding that genuine interactions and relationships are built from people’s ability to be themselves and be comfortable in their surroundings. Early feedback during testing has been very positive, and the brand is deeply committed to moving the needle on the customer experience metric that matters most: Guest Love. When guests fall in love with a brand they tell other people. They come back again. The relationship continues to become more customized and personal, giving the brand every opportunity to elevate beyond a basic transaction and build a loyal following among today’s business traveler segment. It’s because of Crowne Plaza’s awareness and ability to adapt to the changing needs of its guests that this cultural shift is happening. It’s raising the bar for hospitality experiences by building experiences guests will come to love, remember and visit often. Ryan Estis is a Keynote Speaker & Management Consultant blogging about business performance.